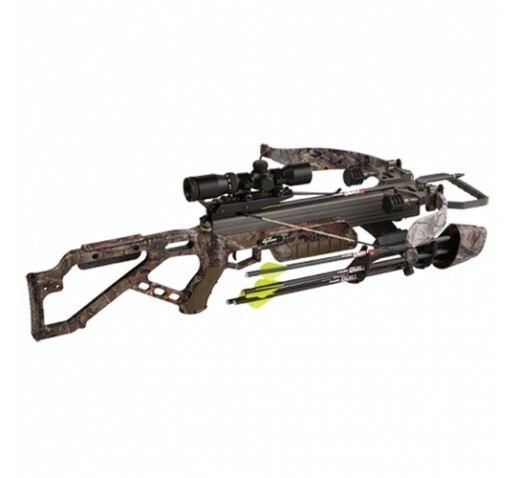 Proof Positive that great things do come in small packages, at 335 FPS this ultra-compact powerhouse churns out all the speed and energy you could need, but with Excalibur Gen 2 CRT limbs that are only 25 inches wide and a 10" power stroke its by far the most compact recurve hunting crossbow in the field! The Micro 335 is ideal for hunting in ground blinds or tight cover. Its amazingly quiet, smooth to shoot, deadly accurate, and like all Excalibur crossbows its built to weather the very toughest hunting conditions for decades of flawless service. The Micro features Excalibur stylish but oh-so-comfortable Feather-Lite skeletonized stock including rubber grip inserts for unparalleled control and feel, and comes with an ambidextrous cheek piece and an oversized trigger guard for cold weather hunting. With the Micro 335 this is your chance to have the narrow width of a compound crossbow but with the world famous reliability and accuracy that only Excalibur recurve crossbows can deliver. - Draw Weight: 270 lbs. - Mass Weight: 5.2 lbs. Note: Arrow speeds obtained using arrows with a total weight of 350 grains (includes arrow and tip).